To qualify for a 1914-15 Star, a soldier had to serve in a theatre of war between 5 August 1914 and 31 December 1915. However, if a soldier had served in France and Belgium between 5 August and midnight on 22-23 November 1914, they would qualify for the 1914 Star. You could not be awarded both a 1914 and 1914-15 Star. 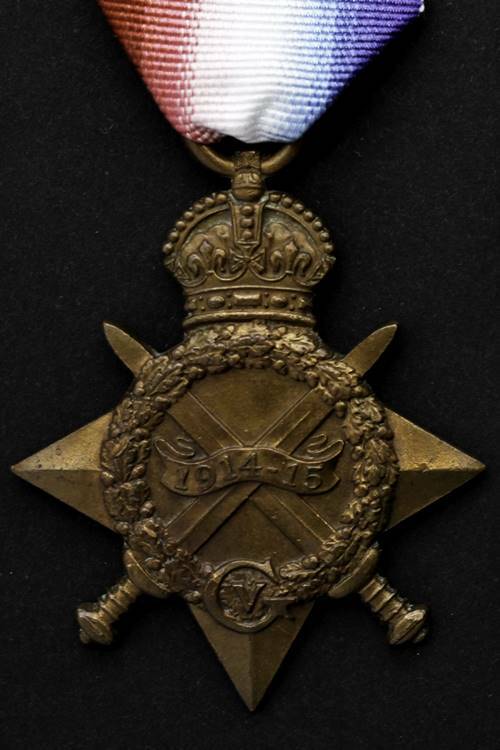 The 1914-15 Star was never awarded on its own as once a soldier qualified for the medal they automatically qualified for the British War Medal and Victory Medal. A soldier could qualify for the 1914-15 Star through service in a wide variety of theatres of war across the globe. While soldiers usually qualified for the medal due to service in France, Egypt or Gallipoli, they could also qualify if they fought at the Siege of Tsing-Tau in China, took part in the occupation of Togo or in one of the many expeditions on the North-West Frontier of India. A complete table of 1914-15 Star theatre of war codes is included at the bottom of this page. Obverse: A star surmounted by the Imperial Crown and crossed by two swords. The medal has a single scroll which contains “1914-15”. The royal cypher of King George V, “GV” is below, resting on a laurel wreath which encircles the scroll. Reverse: Plain, with the recipient’s details impressed. Size: Height 62 mm and width 44 mm. Metal: Tombac Bronze (92% copper, 8% zinc). Naming: Impressed in block capitals on the reverse. There are a variety of naming styles but they should all be impressed. Designer: William Henry James Blakemore. There are two documents which record the award of a 1914-15 Star to a soldier who served the British Army during the First World War, the Medal Index Card and Medal Roll for the 1914-15 Star. The Medal Index Card should record the date a soldier qualified for the medal and the theatre of war they first served in. A soldier who qualified for the 1914-15 Star will have a Medal Roll entry for the medal and a separate Medal Roll recording the British War Medal and Victory Medal. Medal rolls are very important as they usually recorded the exact units a soldier served with abroad. I have written a separate article looking at medal records for WW1 British Soldiers: Guide to Medal Index Cards and Medal Rolls. Both these sets of records are available on Ancestry and it is usually free to view the Medal Index Cards on the site. The banner below will take you to Ancestry. The codes below were usually recorded on the bottom left hand corner of a Medal Index Card next to “Theatre of War first served in” and above “Date of entry therein”. The most frequently encountered code is 1 for Western Europe. The photograph below is of an ancestor of mine, Charles Bryant, who served in the Royal Horse Artillery during the First World War. 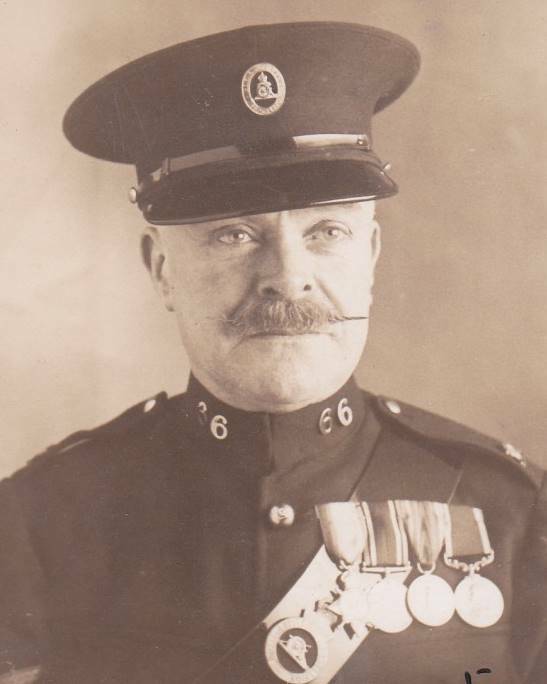 Charles was wearing a 1914 Star, British War Medal, Victory Medal and Long Service and Good Conduct Medal. Unless the photograph is very detailed or was taken close to the medal, then it is usually impossible to tell the difference between the 1914-15 Star and 1914 Star in photographs. If a soldier qualified for the 1914 Star then there is a good chance that they also qualified for the clasp and this does show up clearly on the medal’s ribbon. 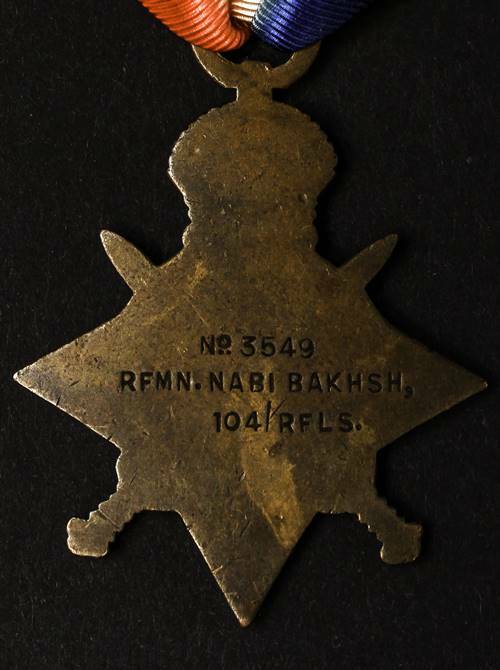 However, many soldiers who qualified for the clasp did not actually attach it to their 1914 Star. The reason I know that Charles was wearing a 1914 Star is due to finding his Medal Index Card which recorded his medal entitlement.